The cofounders of Wagstarter, Dr. Ron and Dr. Bruce, have been close friends since 1988, when they met during their freshman year in veterinary school at Kansas State University. After vet school, they each owned veterinary practices in different states, then Ron moved on to a career in technology, but they stayed in close touch always. During a catch-up call in July of 2016, Bruce told Ron the story of Kaeto, a tiny black kitten, whose owner had recently brought him in to Bruce’s practice. Kaeto was in pain. He had a severe urinary tract blockage, a life-threatening condition to be sure, and rarely seen in a kitten as young as Kaeto. Fortunately, Bruce and Dr. Seth (another doctor in the practice) were able to remove the blockage and save Kaeto’s life, and sent him home to live out a normal life. That’s where most stories like this end, but this story was just beginning. Several days later, Kaeto’s owner hand-delivered the note and check pictured here to Bruce and Seth (we’ve blacked-out the owner’s personal information). Hearing Bruce retell Kaeto’s story on that phone call, Ron then told him of his idea for Wagstarter, inspired by Watsi, that he had “placed on the backburner” a couple of years earlier due to other commitments. Both agreed this was just too meaningful of a coincidence, and that they should immediately start building Wagstarter and use that $5,000 donation from Kaeto’s owner as the seed donation fund for the project. Ron went to work designing and building the website, and together in Bruce’s practice they launched Wagstarter a couple of months later, on September 8, 2016. So, that’s the story of how Wagstarter was founded, thanks to a little black kitten named Kaeto. 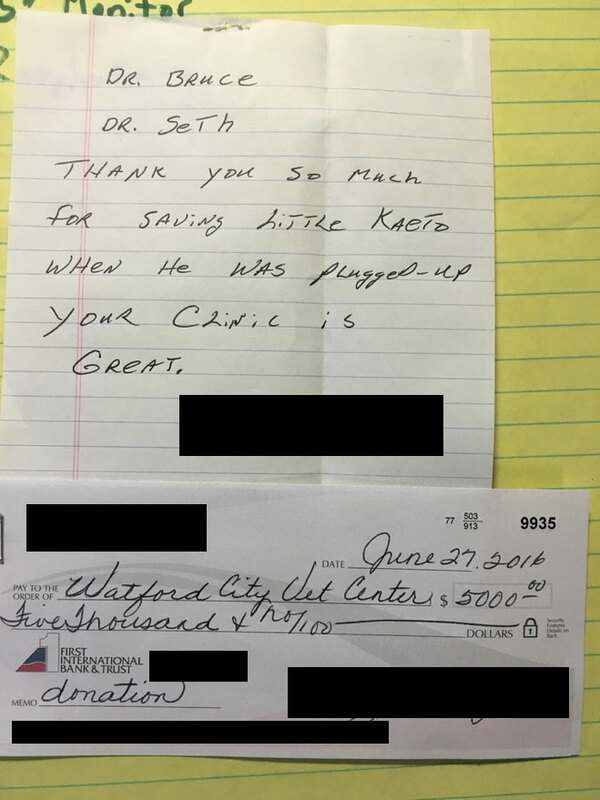 You can follow Kaeto right here as he pays forward his owners' generous donation to 50 other patients, $100 at a time.